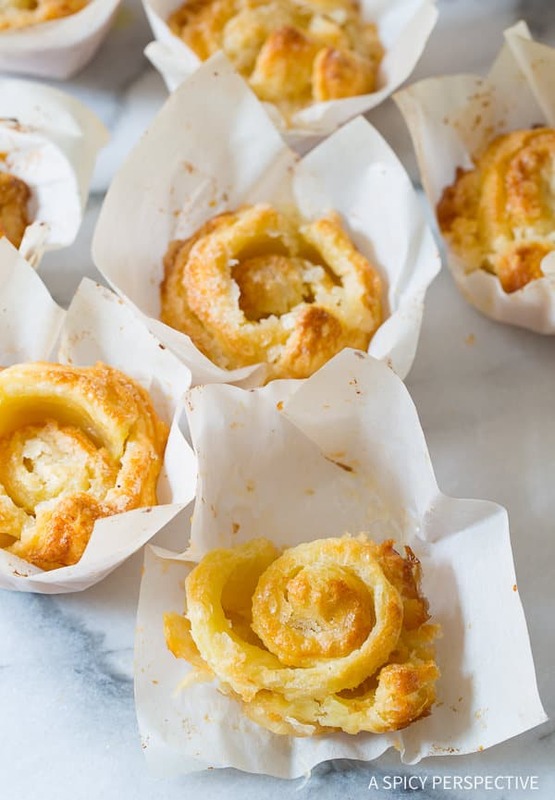 A delicate French pastry made in a hurry! This Cheater Kouign Amann Recipe captures the essence of traditional crusty sugar-crusted rolls, without all the time and effort. Every now and again I like to share a “cheater” recipe… A quick simplified version of a wonderful classic recipe that takes a lot of time and effort to make. I believe there are certain dishes worth spending hours to cook. However, most of us don’t have hours (or in some cases days) to spend on a single dish. In some cases there are ways to mimic the best qualities of said time-consuming dishes so we can all enjoy them. A couple of months ago, I had the opportunity to spend a week in Paris cooking and eating. 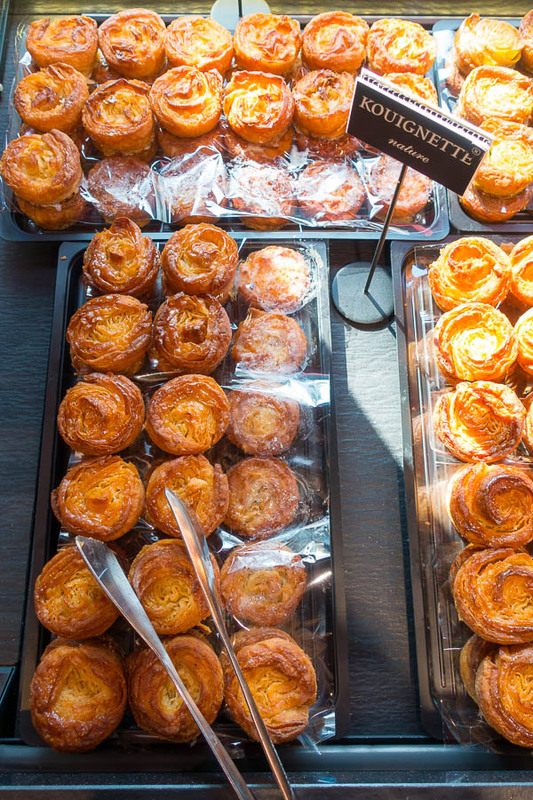 While in Paris, I sampled french pastries on a daily basis, including the famed Kouign Amann. A sugar-coated croissant variation that is usually rolled or folded into little circular crowns. After taking a croissant-making class (which was very fun, by the way) I felt I fully understood why hardly anyone makes croissants at home. Fresh hot croissants straight out of the oven are amazing. Uh. May. Zing. Yet the classic preparation would take a total of three days to complete. You make the dough on the evening of the first day, and chill overnight. Fold in butter sheets and rest on the second day. Cut and roll the croissants on the evening of the second day. Then bake on the third day after they’ve had time to rise. See? Who has time to do that?! Making Kouign Amann from scratch would require the same kind of dedication. I just can’t fathom setting aside the time to do it, especially this time of year. 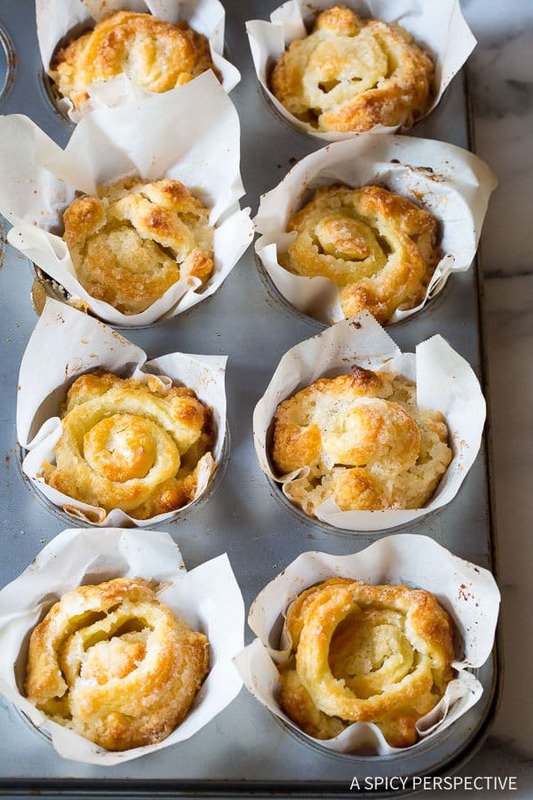 Yet hot sticky Kouign Amann would make a marvelous treat on Christmas morning! 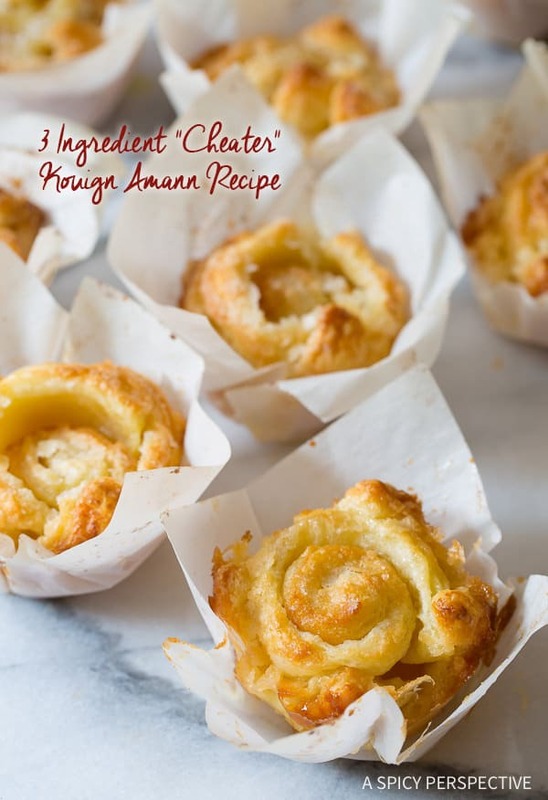 Make a Cheater Kouign Amann Recipe instead! 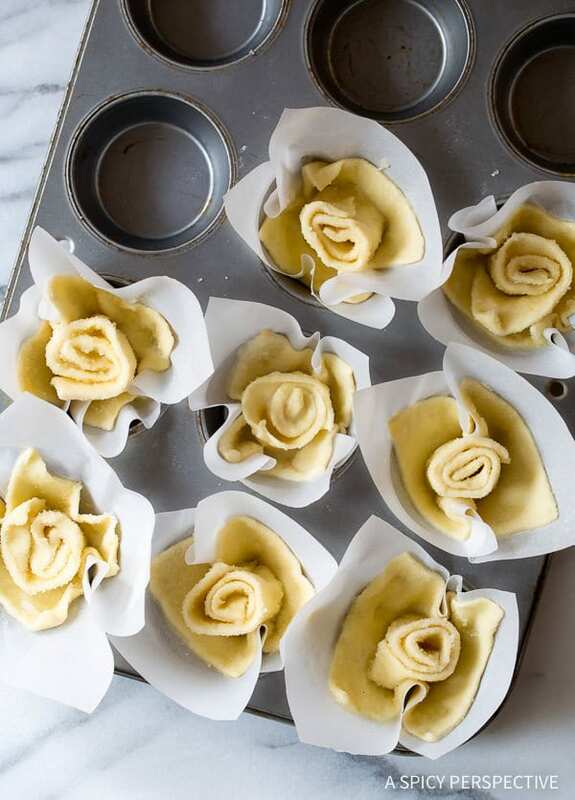 Start by cutting thawed puff pastry sheets in half. Cut one-half into squares and the other half into strips. Dip the squares in melted butter and then press one side in sugar. 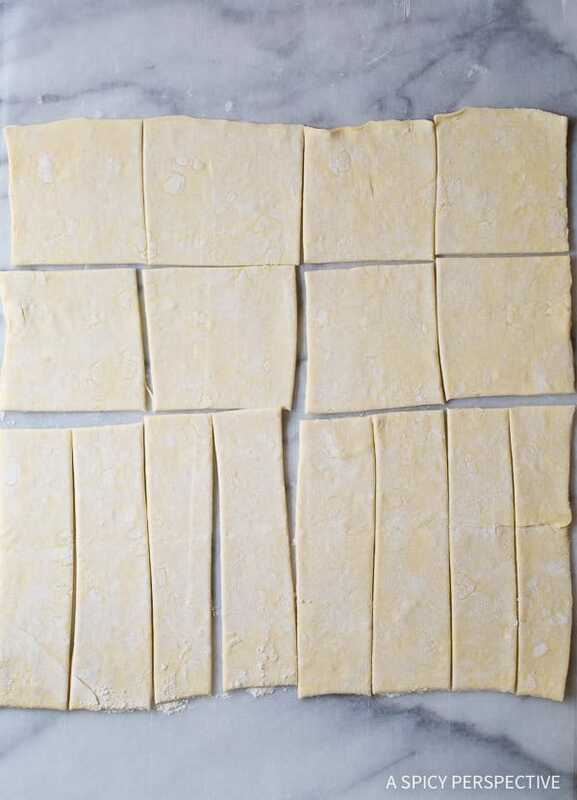 Lay the squares sugar-side-up on little pieces of parchment paper. Dip the strips in butter, then dip in sugar. 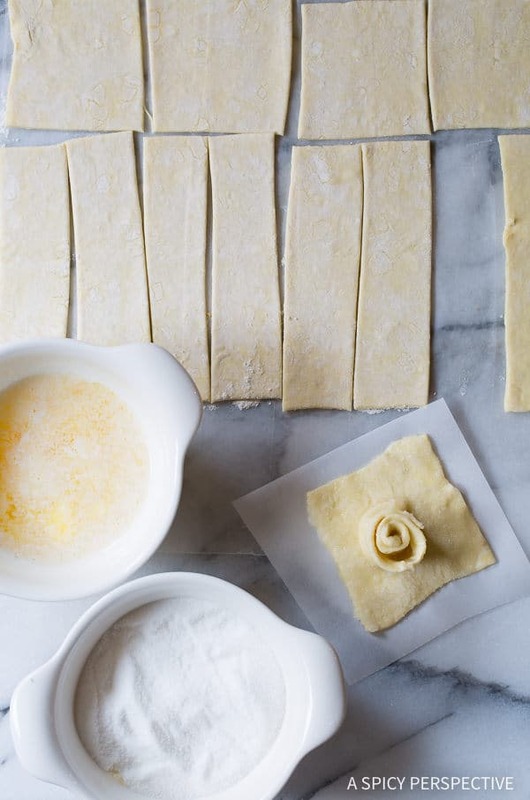 Roll the strip loosely into spirals, and place them in the center of the puff pastry squares. 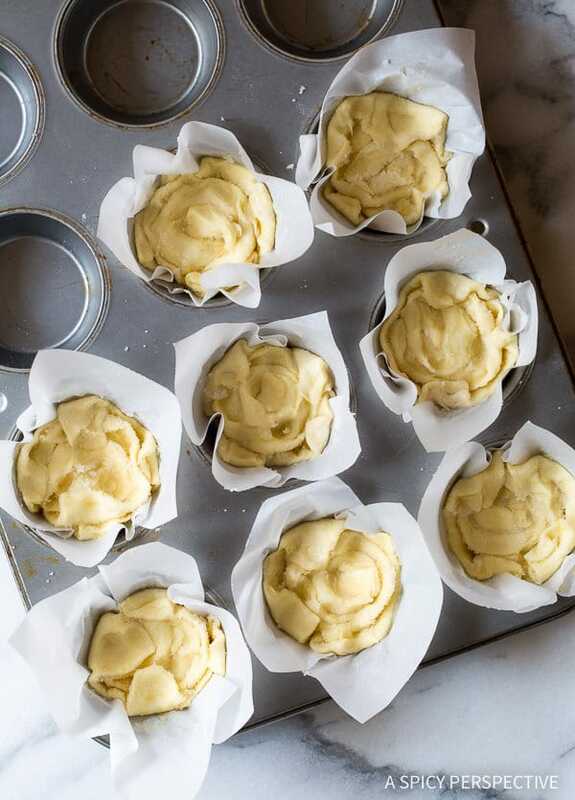 Then pick up the parchment paper squares and place them in the wells of a muffin tin. Puff pastry has a way of fixing itself in the oven. As the puff pastry rises, the butter and sugar create sticky layers on the inside and crusty folds on the outside. Heaven. Pure heaven. Even without the 3 day process. Let me be clear, my Cheater Kouign Amann Recipe can’t compete with Fresh from-scratch authentic Kouing Amann with its seemingly endless sugar folds. Yet, they do capture the taste and texture of real Kouign Amann, and are always welcomed at my house. 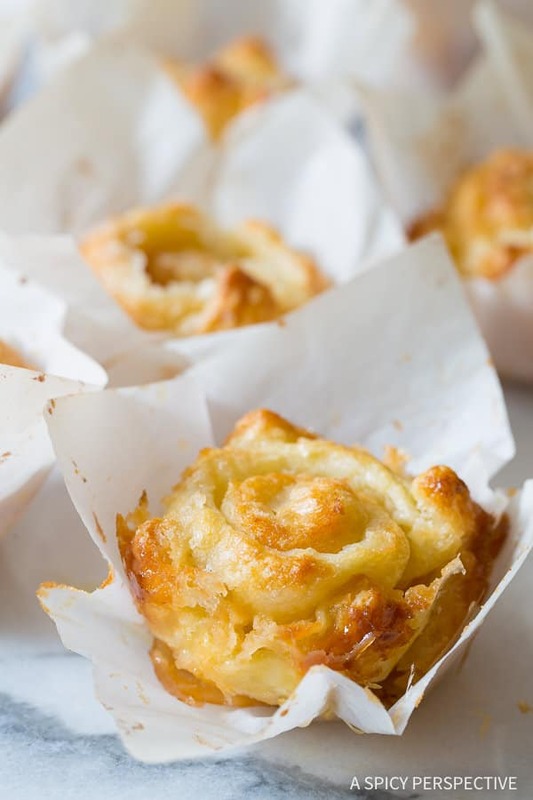 With just 3 ingredients, it’s worth giving this Cheater Kouign Amann Recipe a try! They are a marvelous addition to Christmas or New Years Day breakfast. 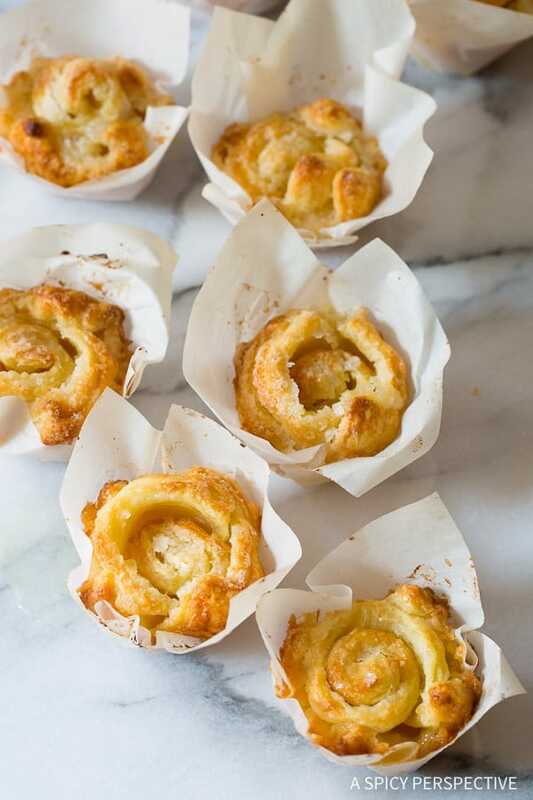 Cheater Kouign Amann Recipe – A simple quick french Kouign Amann pastry recipe for new cooks and those in a hurry. This is a wonderful treat for holidays. Preheat the oven to 400 degrees F. Cut out sixteen 5-inch parchment paper squares. Flour a work surface, lay the puff pastry sheets out, and roll the puff pastry sheets to remove the fold lines. 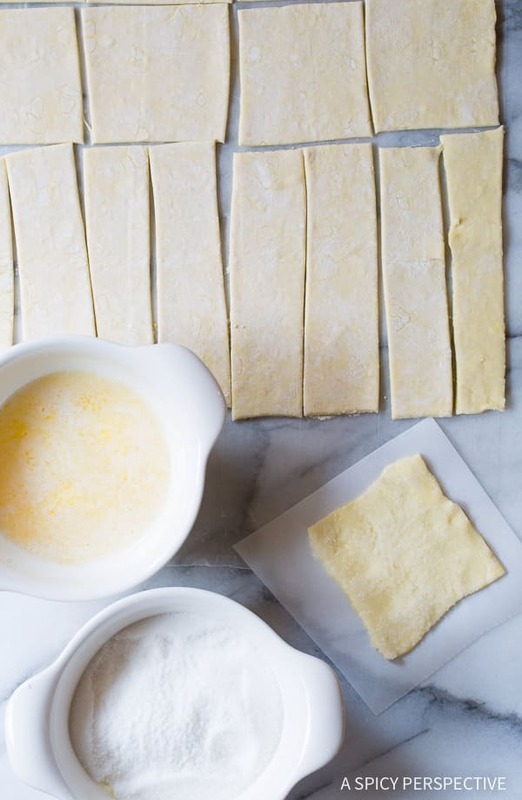 Cut a puff pastry sheet in half. With one half, cut eight even strips. With the other half, cut eight equal squares. Repeat with the second puff pastry sheet. Dip the squares in the melted butter. Press one side of each square in sugar and lay each square sugar-side-up on its own parchment paper square. Then dip each strip in butter. Press one side of each strip in sugar and roll into a loose spiral. Place a spiral on top of each square. Lower the parchment paper squares into the wells of a muffin tin. Press each piece down to fill out the wells. Then bake for 20-25 minutes until golden brown. 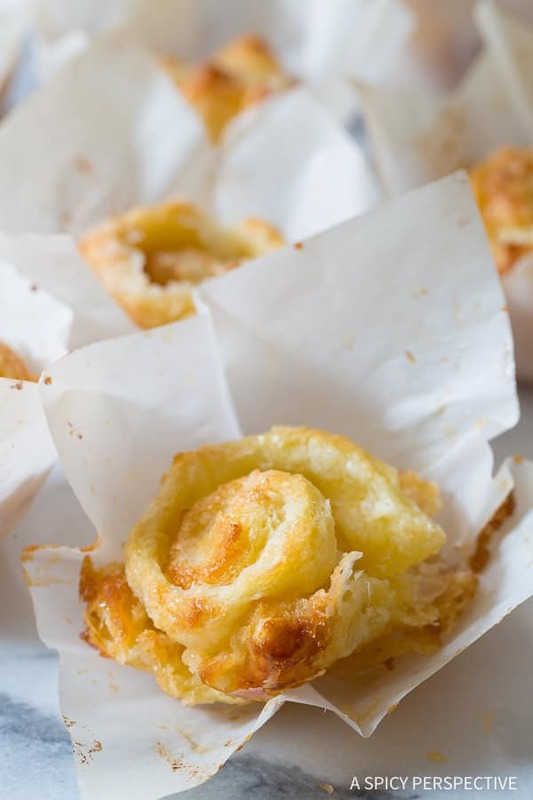 Pingback: Cheater Kouign Amann Recipe - U Wanna Know What? Thank you for these delicious little treats.Just making my second batch. Great hit with the family and friends. These were so good and surprisingly so easy to make. Definitely a winner recipe. I love how quick and easy this is to make! Oh, my Lord!! You will NEVER know how happy I am to see you offering this cheater version!! We live in Brittany (Bretagne) half of the year and Kouign Amann is the traditional dessert of the region. It is soooo decadently wonderful, but it is too involved for me to make at home. So I just wait until we are in Brittany and hit the boulangerie/patisserie for a whole box! Now, I am going to feel like a master and I’m not going to tell my husband how easy you made it for me! haha Thank you! I love working with puff pastry! These are so easy, delicious and pretty enough for a special occasion. I’ve made puff pastry, but it is a daunting recipe. I’d much rather have a shortcut before attempting anything like that again and your kouign amann recipe is perfect. Easy & lovely pastries..Thank you for sharing this lovely recipe . Just tried this recipe…….YUUUM Thanks for posting…I know I will be making these again & again. OMG! You are fabulous! You have transformed a 3-Day tedious recipe into a 45 minutes ‘Fast & Furiously’ delicious piece of cake! I love it! Thank you! I love these! They look like little roses! So easy and so GOOD!!! It really helped to have photos showing how to cut the puff pastry, etc. Thanks for sharing the recipe. 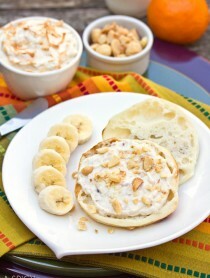 I made these for breakfast today and they were delicious! I used 1 teaspoon of maple syrup poured over the buttered pastry in the muffin tin instead of the sugar, though. It worked perfectly! Not quite as crispy, but the maple syrup helped to create the caramel layer at the bottom. Thank you for a recipe that I will definitely make again! I made these today. Lovely. Next time I can picture them with some marzipan spread on the rolled up strips. Yum! 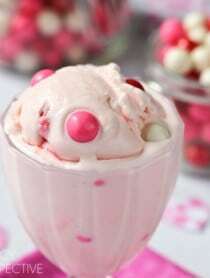 Ma sha allah, Nice easy and yummy,in sha allah I will try this recipe as soon as possible. I love puff pastry…but there’s no way to get 8 small strips from one side and then 8 large aquares from the other side of equal size. It doesn’t make sense. When you slice the puff pastry in half….one side isn’t going to be bigger than the other side. It’s just not possible, sorry. Never mind, the rest of the pictures finally loaded showing how the sheet was cut. Now I get it. Can wait to try these! These look amazing! Would cupcake papers work? Or is parchment paper necessary? Thank you! This is my kind of pastry. And now easy too. Yummy. love the concept of a “cheater” recipe. and these look pretty too! You had me at crusty sugar-crusted rolls! I love how these look like roses!! Gotta try! Can’t wait to try these! Happy holidays to you and your family! I’ve never seen these before, they are beautiful. Hi Cathy, Yes! Just cover them and pop them in the fridge until morning. They may take a few more minutes in the oven, since they’ll be cold. I’d say 30-35. Those look so good and sound so nice and easy! AHHH I LOVE THIS RECIPE!!! I was just in Paris last month and had a kouign amann and I read online how long it takes to make and said, no way! 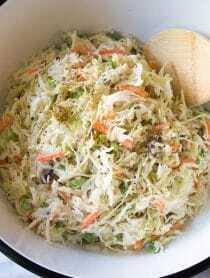 I LOVE this cheater recipe! !